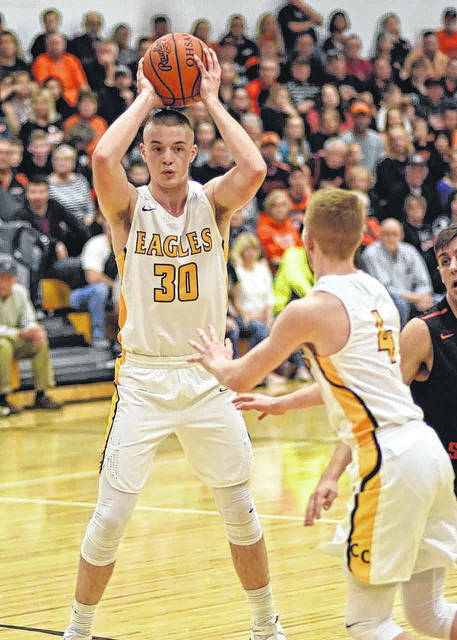 Don Tudor | Galion Inquirer The Eagles Harley Shaum (30) looks to pass to teammate Cam McCreary after he makes the backdoor cut to the hoop. Shaum finished the game with a double-double but the Upper Sandusky Rams would clinch the N-10 title by defeating Crawford; 62-55. Don Tudor | Galion Inquirer Colonel Crawford's senior Brody Martin lays in a bucket for two of his 13 points during Friday's home action against the Upper Sandusky Rams. The Eagles would fall short in their N-10 title hopes, dropping the contest to the Rams; 62-55. Don Tudor | Galion Inquirer A battle at the basket leads to one of Harley Shaum's 13 rebounds on the evening. 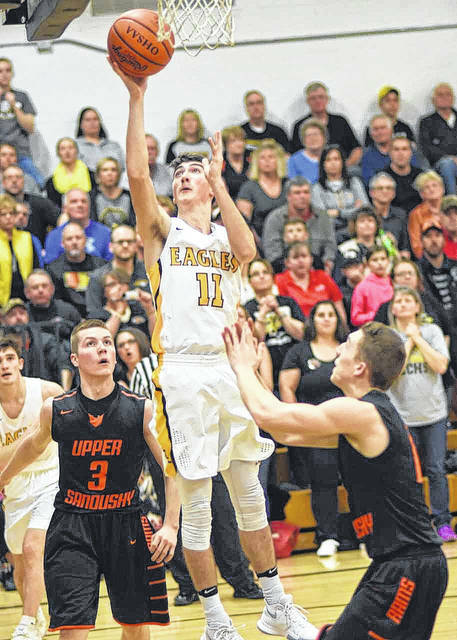 Colonel Crawford hosted the Upper Sandusky Rams at the Mac Morrison Gymnasium on Friday night in the conclusion of the Northern-10 Athletic Conference boys hoops season. NORTH ROBINSON — Mac Morrison Gymnasium was filled to the brim Feb. 23 as the Colonel Crawford boys basketball team welcomed heated Northern-10 Athletic Conference rivals Upper Sandusky Rams in a game to decide the league title. Upper Sandusky took control in the second half to pull out a 62-55 victory and claim the N-10 title. Colonel Crawford finished second. Both teams entered the contest with an 18-3 overall and a 14-1 conference marks. A back-and-forth opening frame was the Eagles grab a 14-12 lead. In the second quarter, Upper Sandusky got to work to take a 29-24 lead at the break. Cameron McCreary led the Eagles with 11 points in the first half. Jevon Dible put in 12 for the Rams. Colonel Crawford kept it close, but never regained the lead after haftime. Upper Sandusky led 49-42 after three quarters. The victory locked down the Rams’ third consecutive N-10 title. McCreary finished with 18 points to go along with six rebounds, four assists and three steals. Harley Shaum had a monster night on the boards. He had 13 rebounds — seven offensive — to go with 14 points. He also had an assist, a block and a steal. Brody Martin had 13 points. Other stats for the Eagles on Friday were: Team- 19/32 from the interior, 4/24 from the perimeter, 5/7 at the free-throw line, 35 total rebounds (14O, 21D), 7 assists, 4 steals, 2 blocks and 12 turnovers; Martin- 7 rebounds, 1 assist; Jordan Fenner- 8 points, 2 rebounds, 1 assist; Hayden Bute- 2 points; Reis Walker- 3 rebounds, 1 block and Gavin Feichtner- 4 rebounds. Dible finished with 21 points for the Rams. Mason Vent and Trevor Clifford turned in 13 and 10 points, respectively. Other stats for Upper in the win were: Team- 14/23 from the inside, 10/22 from the outside, 4/7 at the stripe, 21 total rebounds (2O, 19D) and 10 turnovers; Andrew Kurtz- 9 points; Brett Montgomery- 6 points and Levi Malone- 3 points. It’s now on to the tournament for both teams. Colonel Crawford also received a first-round bye over in the Division IV Willard District as the No. 2 seed. The Eagles will get the winner of the contest between No. 8 St. Mary Central Catholic and No. 10 Buckeye Central in the sectional finals game. The Eagles are looking to land their seventh straight sectional championship. Sheldon reflected on the path ahead: “The great thing even after the loss tonight is that we’re still playing for a championship next Friday. A game like the one tonight does wonders for getting a team ready for a tournament run. Upper Sandusky received the No. 1 seed in the Division III Norwalk District and with that, a first-round bye. The Rams await the winner of the No. 8 Huron and No. 12 Fostoria game in the sectional finals to be held on Friday, March 2 at 6 p.m. at Shelby High School. The Eagles Harley Shaum (30) looks to pass to teammate Cam McCreary after he makes the backdoor cut to the hoop. Shaum finished the game with a double-double but the Upper Sandusky Rams would clinch the N-10 title by defeating Crawford; 62-55. Colonel Crawford’s senior Brody Martin lays in a bucket for two of his 13 points during Friday’s home action against the Upper Sandusky Rams. The Eagles would fall short in their N-10 title hopes, dropping the contest to the Rams; 62-55. A battle at the basket leads to one of Harley Shaum’s 13 rebounds on the evening. 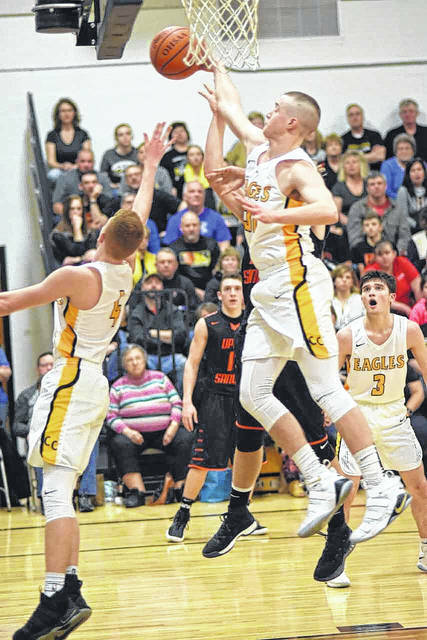 Colonel Crawford hosted the Upper Sandusky Rams at the Mac Morrison Gymnasium on Friday night in the conclusion of the Northern-10 Athletic Conference boys hoops season.